BELIZE CITY, Mon. Apr. 25, 2016–On Friday, Guatemala’s Ministry of Foreign Affairs issued a statement listing the names of 10 Guatemalans who had reportedly lost their lives “at the hands of the Belize Defence Force” over the past 17 years—five of the deaths occurred between 1999 and 2001 and the other five between 2012 and 2016. Belize Defence Force (BDF) Commander, Brigadier General David Jones, said at a press conference held in Belize City this morning that on every occasion, the shooting deaths were acts of self-defense. Belizean soldiers had only responded after coming under attack from Guatemalans, Jones asserted. 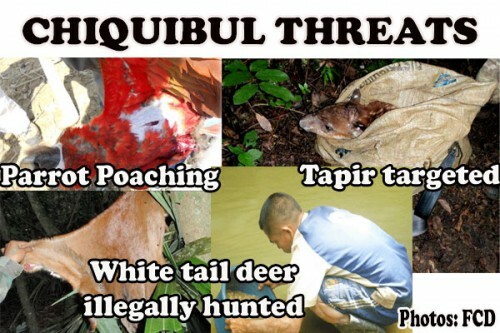 Of note is that most of the incidents happened inside the Chiquibul, in the Cayo District—Belize’s most prized forest where Guatemalans, who enter the country illegally, are regularly caught setting up illegal dwellings, panning for gold, extracting hardwoods such as cedar and mahogany, hunting wildlife, poaching the protected scarlet macaw, and extracting xaté palm leaves—pillaging resources to the tune of millions of dollars each year for which Belize has received no compensation. The first shooting death cited by the Guatemalans was that of Mateo Ramirez, which occurred on June 12, 1999, at the village of Arenal, which straddles the Belize-Guatemala border in western Belize. Initially, the BDF had been accused of shooting Ramirez while he was running away but a Commission of Inquiry held at the Belmopan Magistrate’s Court, at which the son of the deceased testified, found that Ramirez, who was allegedly armed with a machete, had ‘aggressed’ the military, firing chops inches away from the head of a BDF officer. Ramirez was subsequently shot. In the death of Samuel Ramirez, which occurred on January 24, 2000, the then Foreign Minister of Guatemala, Gabriel Orellana, had accused the Belizean military of crossing over into Guatemala and killing the civilian in Las Flores de Chiquibul while he was working on his maize and bean fields. 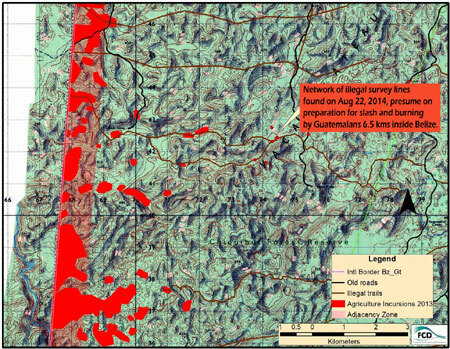 Of note is that the release by Guatemala’s Foreign Affairs Ministry on Friday now puts the location of that shooting as the Chiquibul Forest Reserve, which is located inside Belize. Belize’s then Ambassador to Guatemala, Michael Mena, was quoted by the BBC as saying that the incident took place on the Belize side of the border in an illegal marijuana plantation, and the man was shot after he attacked the BDF. The next three cases cited by Guatemala involved the killing of a father and his two sons: Jesus Ramirez Solano, 61, and his sons Jesus Ramirez Icho and Virgilio Ramirez Icho, on November 22, 2001. This incident reportedly happened in the area of San Vicente, Toledo. Belizean officials had said that the incident had its genesis in a land dispute between the Ramirez family and a Belizean, Rojelio Lobos. The Ramirez family was accused of illegally settling in Belize, but refused to accept that they were on Belizean soil. Then Prime Minister Said Musa said that the Guatemalan had claimed that he had protection and that nobody could tell him anything. Lobos had claimed that his life had been threatened. Musa said that the BDF had been attacked by the campesinos and responded in fear for their lives. Over the ensuing 11 years, there were no reports of killings of Guatemalan civilians by Belizean military, but that changed in January 2012, when Juan Chioc Chub was shot in the Chiquibul. Otto Perez Molina, who had just risen to power, issued a stern public statement calling the incident a human rights violation. “Our people here have been screaming about incursions,” said Prime Minister Dean Barrow at that time, reiterating the Belize government’s commitment to continue to step up security presence on the border. Although Molina said that the shooting incidents ought not to continue, he did not say what measures his administration would have taken to dissuade Guatemalans from encroaching on the protected areas of the Chiquibul. Then National Security Minister of Belize, Carlos Perdomo, had said that the Guatemalans had attacked Belizean military on Belizean soil. Guatemala’s then Foreign Minister, Harold Caballeros, visited Belize to protest the killing and to press the Government of Belize on the investigations. Only months later, in July 2012, continued encroachments in the Chiquibul led to another clash which sadly resulted in the death of another Guatemalan civilian: Luis Alberto Martinez, in the Ceibo Chico area. In a statement released right after the incident, the OAS, even before conducting its investigation on the matter, described the shooting death as “reprehensible” suggesting that the action by the Belizean soldiers should be condemned. However, Belize held its line that the soldiers acted in self-defense when attacked by the illegal logger. The 9th case listed by the Guatemalans is the death of Tomas Desdicho Ramirez, which occurred on March 29, 2014, also inside the Chiquibul. It was the subject of a special investigation by Dr. James Edward Hamdy, of the International Forensic Science Laboratory in the USA. That incident also happened in the Cebada area, where the most recent killing—that of Julio Alvarado, who had previously been deported from Belize for a previous encroachment—also occurred. Similarly, the incident happened while the Belize security forces were on patrol with rangers of the Friends for Conservation and Development (FCD). They had discovered that two huts were illegally constructed on the Belize side of the border and there were clearings for illegal farming. Belize security officials reported that they had come under fire at the time when Tomas Ramirez was shot. He was found with a 12-guage shotgun in hand after he was shot, they said. The other Guatemalan men on the scene reportedly shot at the BDF while making their escape from the area. At the time, Belize and Guatemala issued a joint statement on the matter, in an effort to maintain peace. 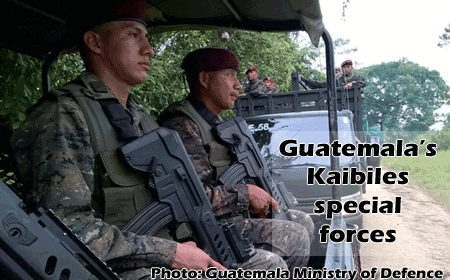 The response of the Guatemalan government to the 10th reported case was unprecedented, with Guatemala mobilizing as many as 3,000 troops, including the Kaibiles, to the Belize border. BDF Commander David Jones said that again, Belize military had come under fire and responded in self-defense. It was already nightfall when the BDF came under fire and they could not see the shooters, Jones said. It was afterwards that they found out that the minor had been fatally hit. Barrow said that FCD has corroborated the report of the Belize military. The OAS has pledged to investigate and Barrow has also invited the US to send an expert to reconstruct the incident as part of a second impartial investigation. While Barrow said that, “The word [repudiates] stuck out like a sore thumb…,” he chalked it up to “some sort of a slip.” When the same light was cast upon the actions of the BDF in the case of Martinez in 2012, Belize’s then Ambassador had taken note of the language and had said that the release, which made an erroneous report on the location of the incident, had been written ‘facily’ by someone from the press office of the OAS. “I regretted the unfortunate loss of life of the Guatemalan minor but recollected that the BDF had several times before come under fire in that very area from armed and dangerous Guatemalans engaged in illegal activities and pillaging of Belizean forests, environment and resources. Our military had every right to defend itself and our patrimony,” Barrow said he maintained in the face of Morales’ claim. As for the recent attack on BDF Staff Seargent Richard Lambey near camp Valentin, Chiquibul, and the murder of Special Constable Danny Conorquie in 2014 at Caracol, also in the Chiquibul area, Barrow said that the problem with these incidences is the lack of evidence to prove that Guatemalans did it, although the circumstances surrounding the attacks support his conviction. At a press conference held last week, Guatemala’s Foreign Minister said that their military has never been responsible for perpetrating an armed attack against Belizean civilians. However, Belize security forces have reported constant attacks while policing not just the border area, but also areas several miles inside Belizean territory while trying to check illegal activities by Guatemalans. Last week’s shooting happened while the Belizean military was addressing illegal farming conducted every year in the Chiquibul. 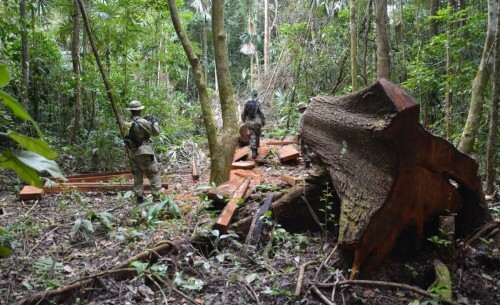 As we had reported in 2014, a week and a day after the brutal murder of Conorquie, the protected area was the site of an armed attack against BDF soldiers and a team of carpenters. They had reported that on October 3, 2014, “an armed mob of about 40 Guatemalans” had threatened to burn down the new conservation post the Belizeans were erecting to stem the unrelenting tide of illegal incursions and encroachments by Guatemalans. A few years earlier, we had reported that there was an armed face-off at one of Belize’s other conservation posts in which a Guatemalan platoon of about 30 armed soldiers and 60 machete-wielding farmers, presumably from Monte los Olivos, crossed over the border in the Rio Blanco area, and traveled 600 meters inside Belize to the conservation post, demanding the return of two Guatemalan farmers whom they alleged had been falsely detained. When xateros delivered multiple machete wounds on BDF Private Marvin Teul in September 2008, at the Rio Blanco Post in Chiquibul, then BDF Commander Dario Tapia had sounded the alarm—underscoring the fact that the threat on Belize’s borders for Belize’s security officers is “very real.” He said that this was particularly so from Guatemalans caught doing illegal activity on the Belize side of the border, and who simply want to retaliate against the soldiers who stand in their way. Amandala had reported that on August 29 that same year, Guatemalans who were illegally harvesting xaté had fired upon a 16-member patrol at the Columbia River Forest Reserve, forcing them to return gunfire and causing minor injury to a Guatemalan. While Barrow told the press today that both he and Morales had agreed Friday to work at both the military and political levels on ways to eliminate further conflict in the border areas, Guatemala’s official statement also issued on Friday claimed that the BDF had maintained an aggressive attitude towards Guatemalans and it went on to reiterate instructions to its military to redouble efforts to protect their nationals as well as “national sovereignty” at the Sarstoon River and at Belize’s western border with Guatemala.